The 'Scia Engineer' open platform offers CAE with a unique consistent structural and analysis model for concrete, steel, composite, aluminium and timber structures. The 'Scia Engineer' finite element analysis allows, by its inherited structural CAD model, a direct 2D or 3D analysis of structural plates, walls, shells, frames and any kind of mixed structures of any partner application as Autodesk® Revit®. 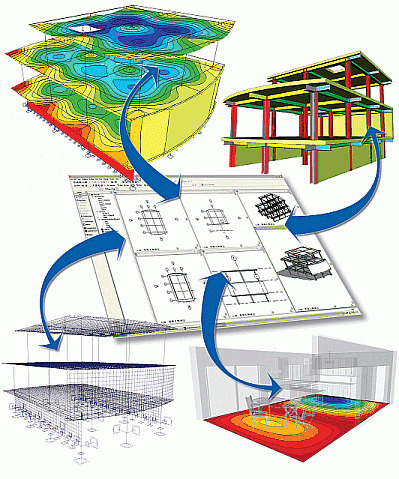 The finite elements application 'Scia Engineer' provides Revit users with the enhanced structural analysis functionalities needed to analyze directly 3D models in depth and on his own workstation. Revit users can send the complete structure or any appropriate part of their model to their construction partners that are using the widely appreciated finite elements application 'Scia Engineer'. Structures fully optimized within the 'Scia Engineer' open platform are updated from within the Revit environment for any changes or additions from the analytical model through the update engine. Counter wise, structures prepared in the 'Scia Engineer' environment can be completed and revised within Revit for further architectural follow-up. The 'Scia Engineer' Open Platform allows AutoCAD and Revit users to use their Revit, dwg, IFC and vrml files for checking their analysis models to reality! The engineered analysis structure are easily visualized, updated, optimized and re-analyzed within its future environment.